Had it allowed the Interxion-TelecityGroup merger to go through, Equinix could end up forever relegated to a number-two position in the European data center market, which wasn’t a future the company’s leadership wanted. For one, if the Redwood City, California-based data center services giant watched the planned merger between two of its biggest European competitors close, antitrust regulations would make it nearly impossible to buy the combined entity, Equinix CFO Keith Taylor said in an interview with Data Center Knowledge. It would also open up the possibility of another competitor snapping up the combined giant, also making a leadership position in the region nearly unattainable. 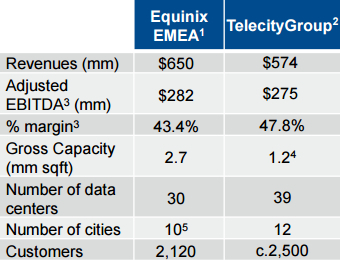 Equinix’s offer to buy London-based Telecity for $3.6 billion in cash and stock, which was announced last week, and which blocked Telecity’s previously announced merger with Interxion, was Equinix playing both defense and offense, Taylor explained. It was defensive in the sense that it served to block creation of an unchallengeable giant in the European data center market. It was offensive because it would add a huge number of strategically valuable assets to the U.S. colocation and interconnection company’s portfolio. If completed, the deal will take Equinix into seven new countries and greatly expand its presence in some key European markets where it already operates. It will broaden the provider’s ability to go after software developers and cloud service providers in Europe, which will in turn increase activity on its worldwide interconnection platform – a cornerstone of its business strategy. Another new market where the U.S. provider will gain instant presence is Manchester. Equinix has had lots of capacity in the London market for years, but never in the north of England. Still, London is central to the acquisition. Equinix’s assets in the London market are concentrated in Slough, a suburb west of the city, while Telecity has massive data center presence in the Docklands, an east-London area. The five-data center Docklands campus is a crown jewel in its portfolio, housing a big chunk of the infrastructure for the London Internet Exchange and a plethora of financial services companies, cloud providers, and customers in other business verticals, such as healthcare, energy, and mobile. “Having access to the Docklands, which is a major network point in the London market, is going to be very attractive for a company like Equinix,” Taylor said. Amsterdam, Frankfurt, and Paris are other core markets where the deal would substantially increase Equinix’s existing footprint. The deal is subject to regulatory review and approval. Taylor said the company expects to close the transaction in the second half of fiscal 2016. By agreeing to acquire Telecity, Equinix has put an Interxion merger with another company into play. “It is our expectation that it would merge with somebody else,” he said.